Currently, it is just a prototype and it needs much work, the kind of work that will potentially turn Slock.it into the very thing it claims to disrupt, a middleman that provides discovery. Uber and Airbnb provide essential platforms for discovery and trust. Although Slock.it can use the blockchain to facilitate payments and automate access to property, these Ethereum-enabled services do not disrupt the essential role of middlemen like Airbnb and Uber do. 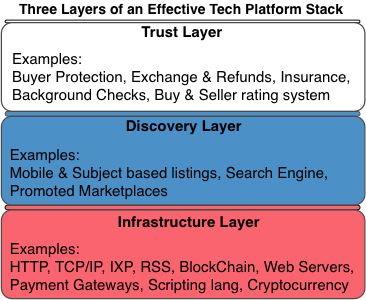 When we examine the platform stack being proposed, we find that there still needs to be a discovery and trust layer, meaning intermediaries like Airbnb and Uber still need to provide discovery and assurance. Collectively, companies like Uber, Lyft, and Airbnb, spend hundreds of millions of dollars on advertising to make the public aware of their services. These intermediaries use their large advertising spend to help draw millions of potential customers to their respective marketplaces. This is how discovery happens and Airbnb property owners reach consumers with their offerings. Without the intermediary, these properties owners would have to become expert marketers to efficiently market their properties. You can attempt to rent or sell any product or service, but you still need an effective go-to market strategy. The novelty of the Ethereum Computer won’t draw the same amount of people to the platform in a similar fashion to the novelty of the Craigslist or eBay platforms. Why? Because unlike the Ethereum Computer, the Craigslist platform stack had the two essential layers of the tech platform stack, the technological-infrastructure layer, using the Web to replace the typical newspaper listing, and the discovery layer, a centralized platform with a user interface for discovery. eBay has all three layers of the tech platform stack. This is why it is more popular than Craigslist on a global scale. The proposed Ethereum Computer in contrast currently only has the tech infrastructure layer* (see footnote). A property owner on Airbnb can use Slock.it technology to automate certain things like payments and providing access to properties, but there still needs to be an intermediary to provide discovery and assurance. Uber and Airbnb also provide assurance that what customers pay for is what they are going to get. When a customer hails an Uber car, he or she has the expectation that the driver is a safe driver with a license and that the car is in good working condition and is covered by insurance; this is the assurance Uber provides. Now this isn’t always the case 100% of the time, but it is close. Similarly, the assurance Airbnb provides is that you are renting from a safe property owner who has home insurance. Assurance against bait and switch is also included. The renters are assured they will be provided the apartment that is being offered on the Airbnb listing. There is currently a proposal from Slock.it to offer insurance via SafeShare to objects connected to the Ethereum Computer, but this level of assurance is very limited. Moreover, there is no fair way for the Ethereum Computer to provide Airbnb’s level of assurance without a neutral third party. When we take a critical look at Slock.it’s proposal it is clear that while its blockchain-based technology could provide automation to everyday objects like door locks, it won’t eliminate the need for the middlemen like Airbnb or Uber. 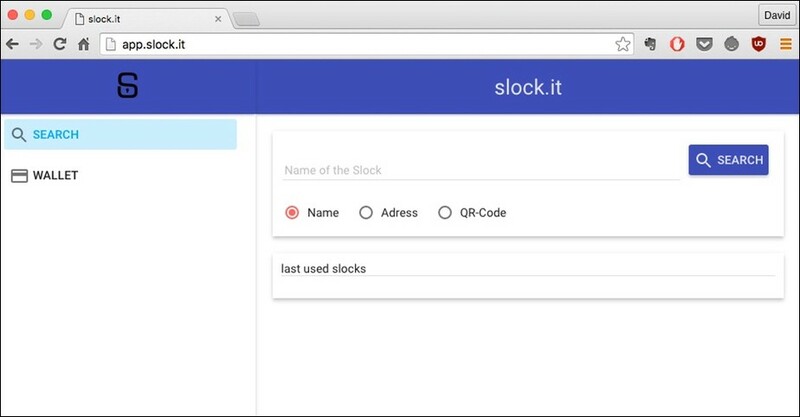 Slock.it is an Ethereum-connected tool of convenience and automation, but that does not necessitate disintermediation. This critique does not mean I am bearish on Blockchain technology or even the Ethereum Computer. On the contrary, it is possible for the Ethereum Computer to automate how new cars are sold, but big-monied interests require intermediaries by law. I am also confident that Blockchain technology, specifically Ethereum and Bitcoin, can have a major effect on local and global commerce with the aide of trustworthy and capable third-party intermediaries.